Plagiarism is bad, but how can we avoid it? So let’s keep this nice and simple. The simplest way to go about defining what plagiarism is would be to say that it is the act of using someone else’s words or ideas as your own and not giving them the proper attribution that they deserve. If this was all that there was, then it would be pretty simple to determine if someone had committed an act of plagiarism while sharing the importance of public speaking. However, it turns out that there is actually a great deal of grey area when it comes to plagiarism. It’s even possible that someone could be committing plagiarism and not even know it! One of the most important things that we need to realize is that different cultures view plagiarism differently. In fact, today’s modern online plagiarism checkers have been taught to detect up to 10 different unique types of plagiarism. One of the tricky issues that shows up when you start to talk about plagiarism is just exactly who “owns” words. In the Western world, we tend to view the words that we say or write as being a part of our intellectual property and so we own them and others should not use them. As speakers, we need to take a step back and think about what we are doing when we are creating a new speech. What we’d like to be able to do is to communicate with our audience using our own voice. We’d like to be able to use the skills that we have developed in order to establish a connection with our audience. We’d like to avoid committing plagiarism because if it happens, then all of sudden we are not presenting our true selves to our audience. Instead, we are trying to come across as someone else and that really is not fair to our audience. If we choose to borrow someone else’s material, we’re going to have to make some judgement calls as to just exactly how much of it we are borrowing and if we need to give credit to the person who created it. How Can Speakers Avoid Plagiarism? If we can agree that plagiarism in public speaking is a bad thing, then we need to spend some time thinking about how we can prevent ourselves from using other people’s material. Assuming that we are not deliberately trying to copy what someone else has said or written, then we’re facing the challenge that we could make a mistake and use too much of their material inadvertently. One of the easiest ways to make sure that we are avoiding plagiarism is to create a speech that just contains our own personal stories. If it’s our story, then there is no way that we can be copying from anyone else. The good news is that every audience enjoys it when you tell a good story. The fact that it’s your story will help you to establish a deeper relationship with your audience. If you do choose to include someone else’s work in your speech or in one of your stories, then make sure that when you do you give them credit for their content. One of the most important things that you can do when you are researching a new speech is to take notes. These notes will serve as the raw material that you use when you start to pick the words that you’ll use to create your speech. However, you can quickly run into problems if you take a look at your notes and you can’t tell if what you’ve written that is your own original content and what is copied from someone else’s material. What you are going to have to do in order to prevent problems from showing up is to become a very good note taker. Make sure that anytime you take notes, you very carefully cite the source that they come from. There are times that we want to invite someone else’s words to play a role in a speech that we are giving. We do this by quoting them. However, quotes can be tricky beasts – it’s important that we get the quote correct. If you decide to quote someone, don’t try to do it from your memory. Instead, take the time to find an original source for the quote so that you’ll know that you’ve got it correct. Likewise, make sure that you are 100% sure who you should be crediting for this quote. Feel free to use the internet to check any clever phrases that you think that you’ve thought up all by yourself – often it turns out that we’re just thinking about something that someone else has already said! As speakers we prize originality in all of our speeches. Our audience has shown up to hear us speak and get the benefits of public speaking from us, not someone else. What this means is that we want to be able to deliver to them original content in our speech. This means that we need to be very careful to not plagiarize. Sure, we all know what we need to not do, but it turns out that in the right circumstances we can end up accidently committing plagiarism. 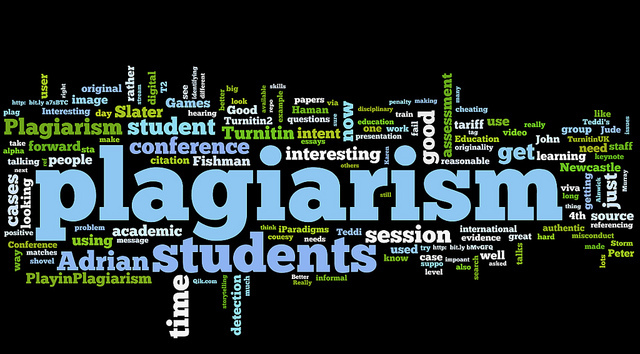 Plagiarism occurs when we use someone else’s words or ideas and we present them as our own. The problem with plagiarism is that there is a lot of gray area when it comes to what is permitted and what is not. Our upbringing, our culture, and how we personally view intellectual property can all play a role in where we draw the line when it comes to plagiarism. If we want to avoid plagiarizing someone, we can include a lot of personal stories in our next speech. These are our stories and will prevent us from using other people’s material. Additionally, when we are researching a speech, we need to take the time to take very careful notes. We wouldn’t want to make a mistake and include someone else’s material thinking that it was our own original content. Finally, if you are going to quote someone, make sure that your double check the quote to make sure that you get it right and that you attribute it to the right person. Creating a new speech is hard work. As all of those ideas flow though our heads, we need to be very careful to make sure that we are able to determine which ones are unique and which ones are ones that we’ve heard other people say. Plagiarism is a fine line and we want to stay on the correct side of it. Take the time to carefully collect the information for your next speech and make sure you give credit where it is due! Question For You: Do you think that you should get someone else to read over your next speech in order to detect any plagiarism? After you’ve been giving speeches for a while and you understand the importance of public speaking, you may run into someone who tells you that you are really good. In fact, they may say that instead of just speaking for free, you really should go pro. Just like all of those famous professional speakers out there like Tony Robbins, Bill Clinton, etc. you could get paid a lot to go to the effort of doing what you are already doing! This brings up a very good question. Just exactly how hard is it to make a living doing the professional speaking thing?